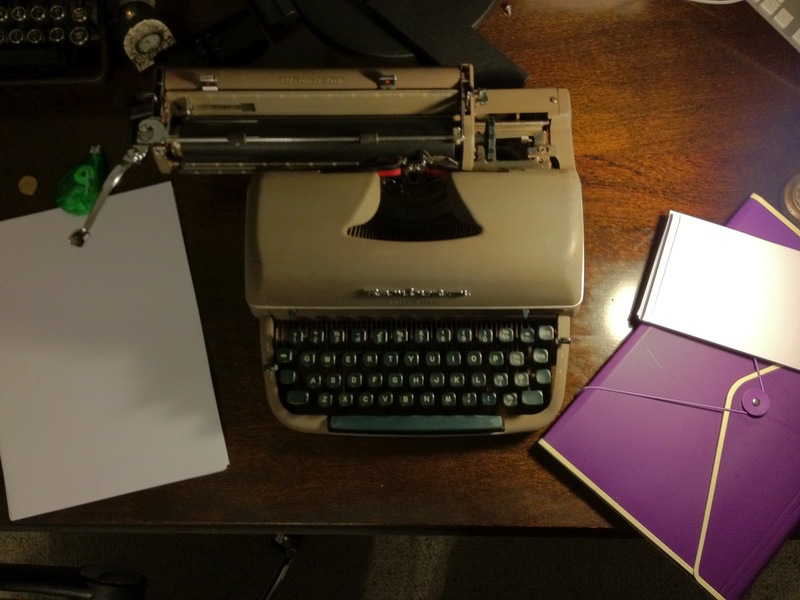 I spent the evening with getting close and personal to my Remington Quiet-riter, some paper scored from the recycling bin at work, and some pre-stamped envelopes. I’d bought this typewriter just before I moved house, and I hadn’t had any time so far to spend some quality time with it. When I first got it, it felt stiff and unwieldily. A morning spent with a scrubbing brush to clean up the shell, and a few dabs of oil and this beastly typewriter from the 1950’s came alive. I showed a photo to a friend of mine at work, and her response was ‘Ugh! It looks mean. If it could talk I’m sure it’d growl’. Anyway, I really just wanted to write. So I did. I dropped the typewriter on the back deck of the house, and listened to the trains in the distance while I tapped out a letter to my 1 year old Nephew. Sure, he can’t read, but that’s not the point. It’s really a latter to his family, about his family. It’s short, brief and a little hello from the clan. And I hope my sister isn’t too upset by it! I can only wait and see I guess. Till next time, have a great day. April 16, 2012 in desk, letter, nephew, quiet-riter, Remington, writing. And yes, there was even a dear Mary letter in there. Do you find that you write slightly differently with each machine that you use?